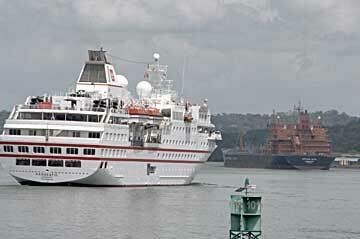 MS Hanseatic (previously Society Adventurer) is a five-star cruise ship owned by the Hapag-Lloyd cruise line. It is the only five-star expedition-cruise ship worldwide. Built in 1991, she specialises in trips to the Antarctic. She was built as Society Adventurer, but was renamed when she was purchased by Hanseatic Tours, as the fourth in a line of Hanseatics. 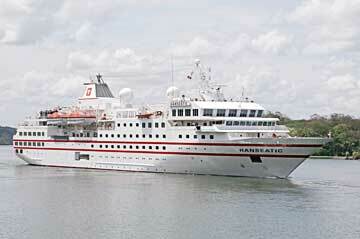 In 1997, Hapag-Lloyd purchased Hanseatic Tours, and she passed into their ownership. 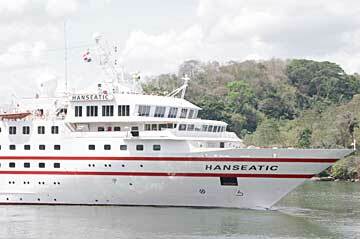 The MS Hanseatic is shown here in the attached images on her North Bound Panama Canal transit on April 14th 2010.